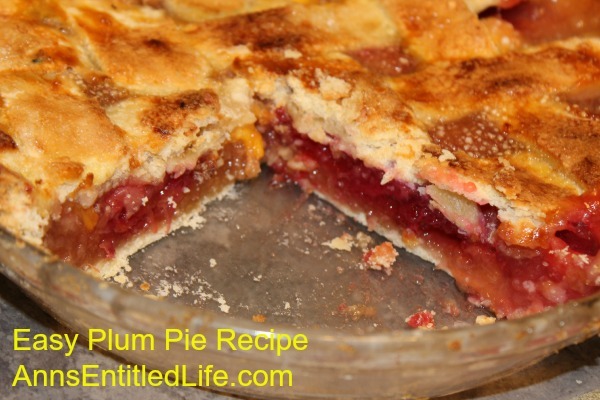 Now is the time to make this easy plum pie recipe when plums are in season! Sweet and delicious, this lovely plum pie is a wonderful dessert that everyone will enjoy. • Wash, peel, pit and dice 4 cups of plums. Use a variety of plums for color. • Combine plums, tapioca, white sugar and brown sugar in a large bowl. Allow to sit for 15 minutes. • Pour plum mixture into pie crust. • Top with second pie crust, cut 6 slats for venting. Or, form a lattice crust with strips. • Beat your egg, and brush over the top of the pie crust. • Sprinkle 1 tablespoon of decorator sugar (you can use raw sugar if you don’t have decorator sugar) over the wet egg. • Cover the edges of the crust to prevent burning. • Bake for 40-45 minutes, or until pie is golden brown on the crust and the filling is bubbly. At the 30 minute mark, remove the crust edge covering to allow the edges to brown lightly. • Allow to cool completely before serving. Originally, I had no intention of sharing this recipe. I had tried several times to make a plum pie, and they always tasted tart, didn’t set properly, burned, or something went wrong. Plums aren’t always that easy to bake with. I had no confidence in this recipe after my prior failures, so when Hubby asked if I wanted photos before he cut into the pie, I declined. Hubby went away with his pie chewing like he hadn’t eaten in a week. He finished his slice in record time, so I decided to try a piece myself. Hubby laughed at me when he heard me snapping pictures. When I told him I changed my mind, he laughed harder. He then complimented the pie. Hubby can be a tad critical of my (ok anyone’s) baking, so a compliment from him really is worth quite a bit. Hubby liked this pie, and so did I! 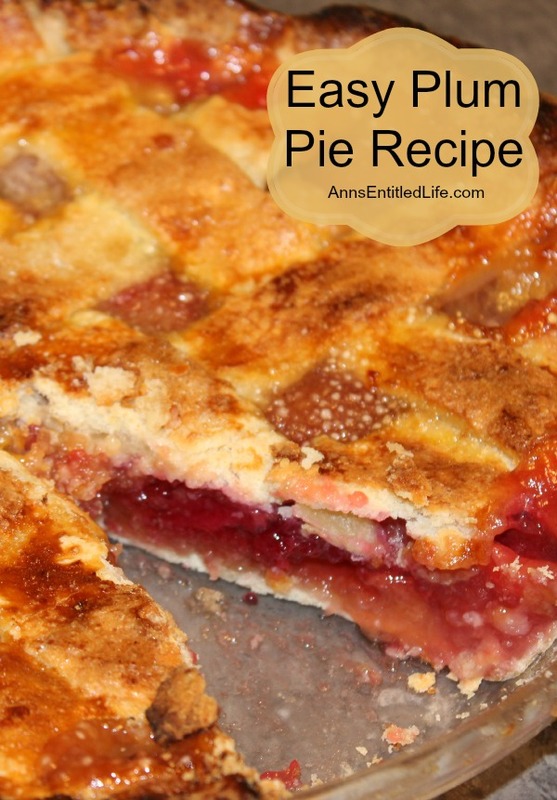 I hope you will enjoy this easy plum pie recipe too. Note: for the crust, I used my Easy Pie Crust Dough Recipe because it is, well, easy! Good Afternoon Ann, I was visiting Munching Mondays and saw your Easy Plum pie and thought I would pop over to say hello. I love plum pie so I was interested to see how you made it. I have never used tapioca to soak up the plum juices, I have always used cornflour. I am looking forward to trying your recipe as plums are in season at the moment. Wow, this looks delicious! Pinning! Thank you for sharing with us at the Brag About It Link Party! Hope you have a great week! Popping back over to let you know that I will be featuring your recipe on the next Brag About It Link Party! Hope you can join us – the party starts Monday at Midnight. Have a great weekend!